Maybe some of you were worrying about us because we had a bunch of views yesterday and today and there was nothing new for you to view. Sorry about that. So, what has been going on? Weather-wise, the past two days reminded us of Lumberton. It has rained and rained. We walked out to check the mail late this afternoon and the ground reminded us of Lumberton. Soggy! BTW, the Lumber River is still in flood stage. Wednesday, we went back to Oneonta. Max needed a haircut, really needed a haircut! We went by to see the Aunts, went shopping for them and then back to deliver the purchases. We also bought a new sink faucet for Helen’s house and groceries for ourselves. The rest of the day was spent on estate business. Thursday we went to Tuscaloosa, more estate business. It was an all day chore, some of which was not very pleasant. On the way home we stopped at Sam’s and Publix both of which had some really good samples, so we didn’t need supper. Today it was back to Oneonta to take care of some of Max’s Mom’s estate business, visited the Aunts, and picked up the last of the supplies for Christmas. The rest of the day was spent on accounting for Anne’s family, emails and an interview for a NOMADS applicant and more estate stuff. We were very busy, and the past three days have been very tiring/stressful, but not very interesting to read about. 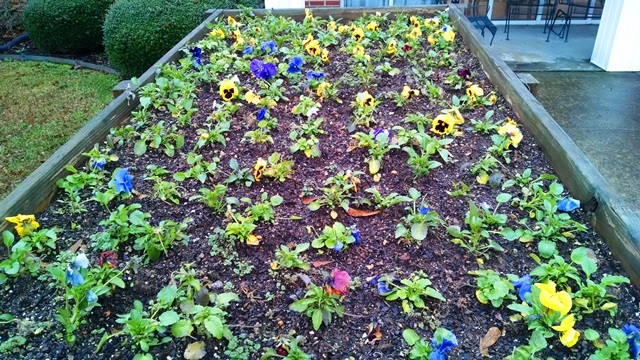 So, since we didn’t take any pictures, we did notice at the nursing home that they had filled the bed where they grow tomatoes in the summer with pansies. So pretty. Especially on such a gray, rainy day. A little bright spot that was appreciated.